Packaging Innovations 2017 was an opportunity for us to showcase some of the Design Hub’s exciting packaging capabilities whilst also celebrating its first year of bringing cutting edge design to the market. This year, our focus was on the future of the packaging industry. We built an exciting tactile display to explore the concepts fully and demonstrated how, through print finish, texture and colour, we could bring those Spring / Summer 2018 trends to life. The Design Hub’s suite of capabilities and print techniques demonstrated at the stand included varnishing, debossing (both on paper and foil), optically variable inks, high gloss UV, heat sensitive inks, iridescent foils and rubberised inks. In sharing our insights on the future industry trends and our knowledge of creative structural and graphic packaging design, we were able to showcase our best-in-class manufacturing capabilities. One of the examples of this was our new packaging display piece, which we showcased at Packaging Innovations 2017. 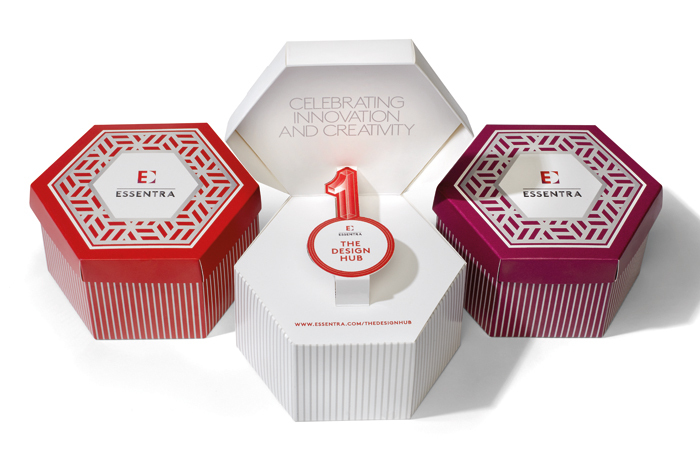 We looked at incorporating a hexagonal shape with structural design, whilst adding a spot UV print finish and a bespoke pop-up element for an exciting and enticing example of custom-made premium packaging.